Marcus, Andreza and André by Gustavo Lacerda (b. Belo Horizonted, Brazil, 1970) forms part of the Albinos series. The work is on view at the PHotoEspaña Latent Element: 10 Photographers from Latin America exhibition at Casa de América, Madrid, Spain (6 June - 26 July 2014). 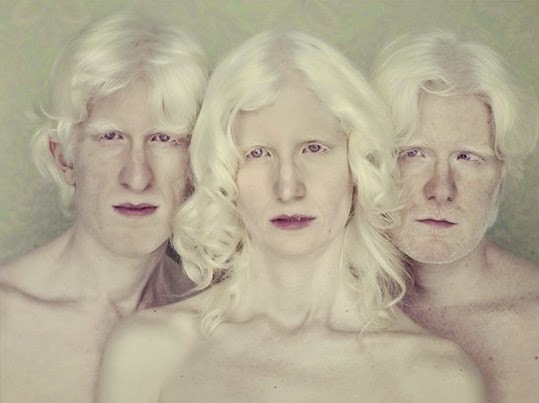 Lacerda's ongoing series of albinos in Brazil came to life in 2009. Having gained his subjects' trust, he invites them into his relaxing studio. Using classic portrait lighting and pale backdrops, individual personalities are revealed. The resulting images are striking and focus on a group of people at ease with themselves. Abinism is a congenital disorder characterised by the complete or partial absence of pigment in the skin, hair and eyes, resulting in vision problems and greater susceptibility to sunburn and skin cancer. Albinos are often scrutinised by society simply due to their unique pigmentation.